I have a few things to say about this. First of all, any impressions that you may have been under about me being cool should officially be erased by now. 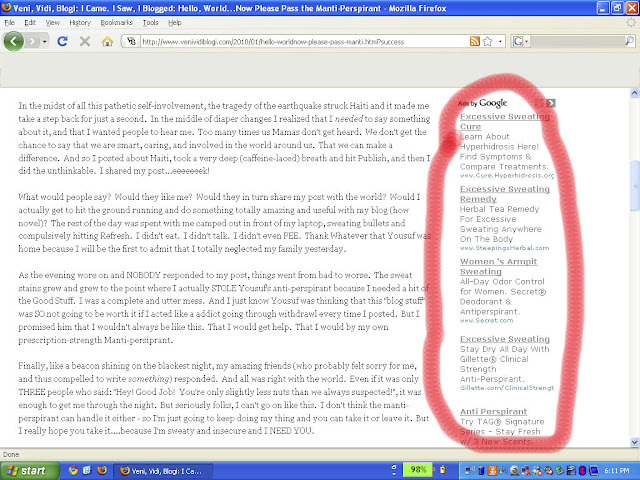 Secondly, how stoopid can Google AdSense be? I get that the ads are placed based on "Key AdWords" (oh and I love how it's somehow more official because they mashed two words together) - but just because I said the word "sweat" does not mean that this blog is about hyperhidrosis. And third,who knew Tag came in three new scents? So of course, the evil genius/poop disturber in me wants to just have fun with this for a while. I will now type the words ingrown, discharge, facial hair, constipation (my poor Nissa is having bum issues, so this is fresh on my brain right now), feminine hygiene, and muffin top. And now we shall sit back and see what happens. Come on, say it with me folks: ingrown, discharge, facial hair, constipation, feminine hygiene, and muffin top. Let this be your mantra for the day. Ingrown, discharge, facial hair, constipation, feminine hygiene, and muffin top. Oh and before I sign off for the weekend, I have to mention that people are really loving the word manti-perspirant. I think me and my SIX subscribers (thank you, lovely people. My life is complete knowing that you are here) should try to make sure that "manti-perspirant" enters into the lexicon of our generation. Who knows, maybe it'll become as famous as the word "bootylicious"or " unfriend" (which was just listed as "The Word of 2009". Seriously, folks - if "unfriend" got in then surely "manti-perspirant" stands a chance). So my challenge to you, dear readers, is to go forth and propagate the word "manti-perspirant". As in: "Dang. This crazy chick I read about online sweats a ton. She needs some manti-perspirant!". Tweet it, Facebook it, share it. I double-dog dare ya. Ingrown, discharge, facial hair, constipation, feminine hygiene, and muffin top. Happy Friday, peeps. It's been a helluva week. See you on the flip side.